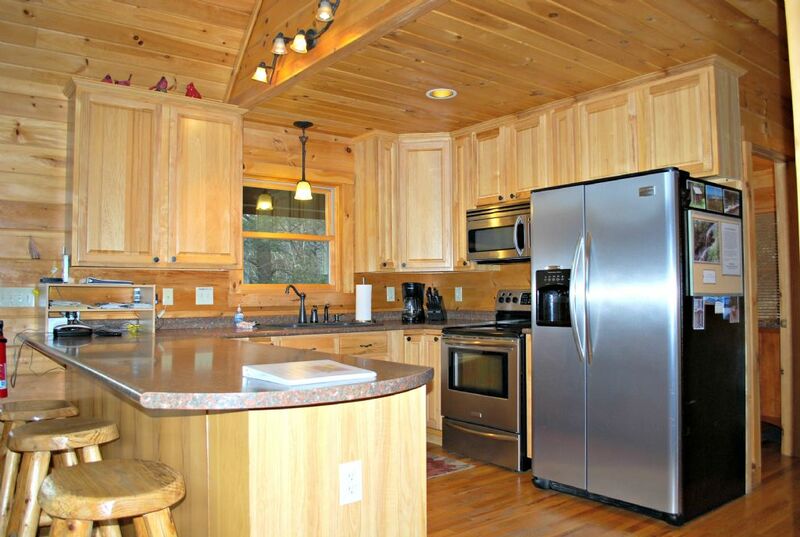 Mtn Lair is a riverfront custom log cabin located in a private and picturesque setting. 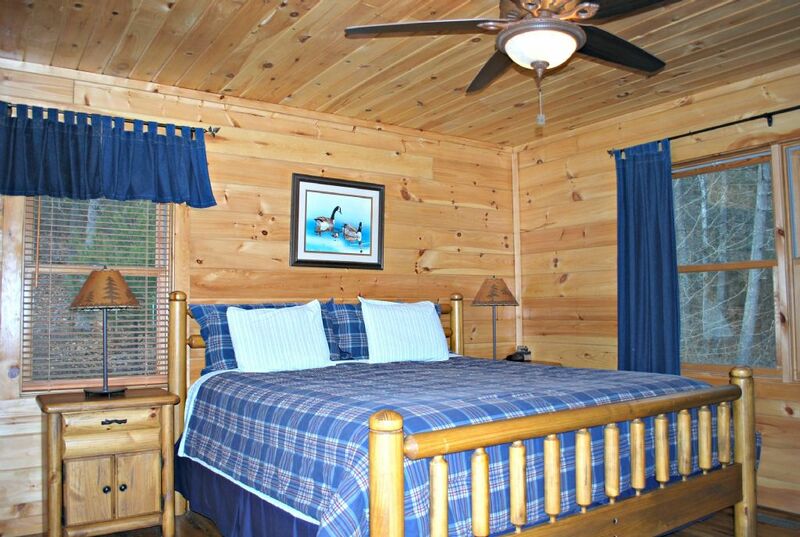 The cabin is loaded with amenities that will enable you to maximize your vacation experience. 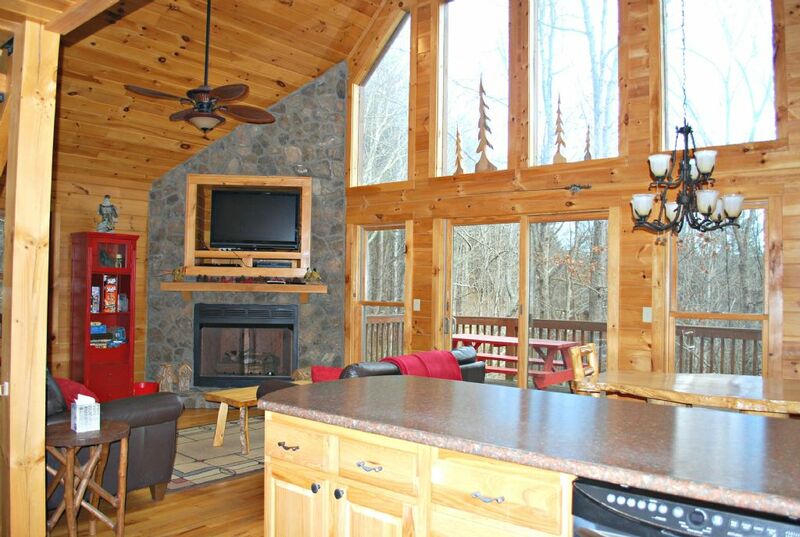 Enjoy the views of the New River and wooded surroundings from many different decks. 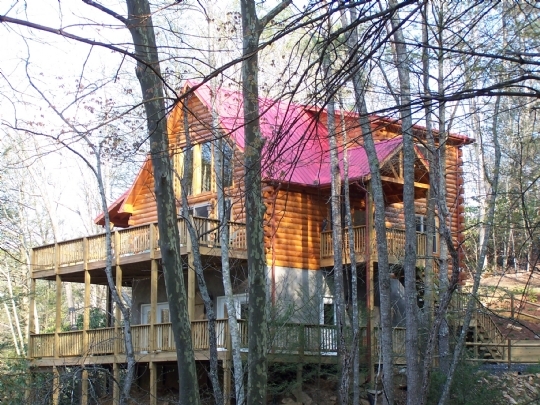 You can fish, tube or just play in the river all in view of the cabin. 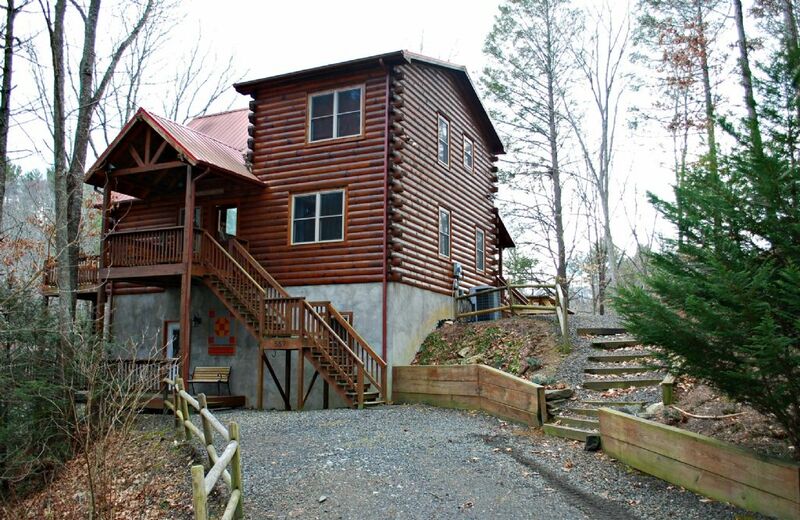 Enjoy hiking through the woods or take a casual stroll along the private gravel roadway. 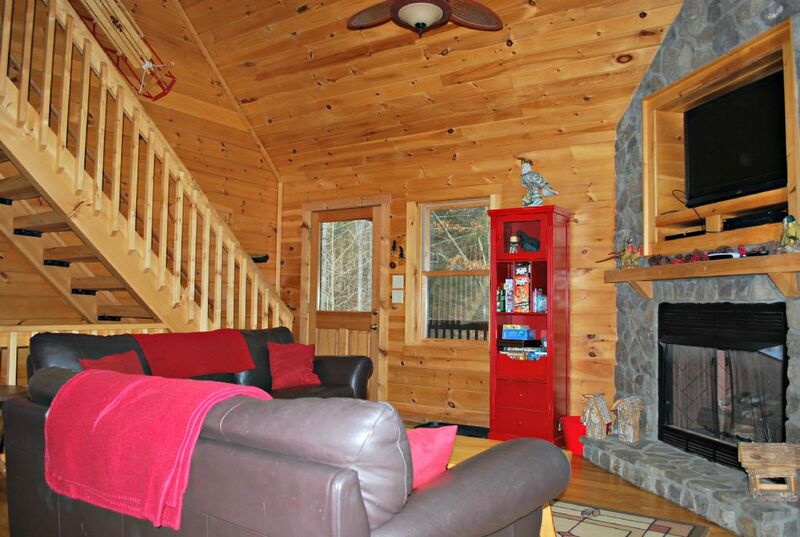 Designed for the entire family to enjoy, this cabin features a great-room with vaulted ceiling & exposed beams, stone fireplace with gas logs, a flat-screen HDTV and DVD. Relax by the fire while watching a movie on the comfy leather sofas. High-speed wireless internet is available for your use along with many DVD movies, games, puzzles & books to entertain the young and young at heart. 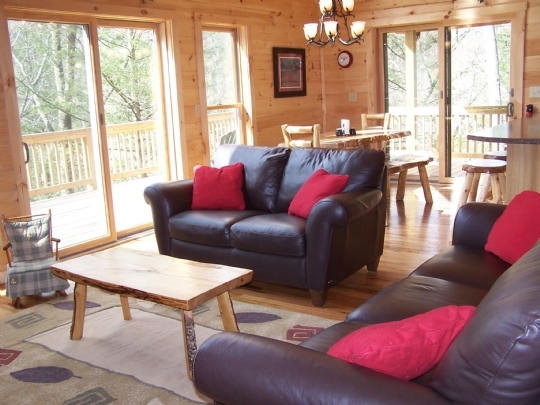 Access the large open deck or side covered deck from the living or dining area to enjoy the cool mountain breezes, picnic table, rocking chairs, gas/charcoal grill and scenic river views. 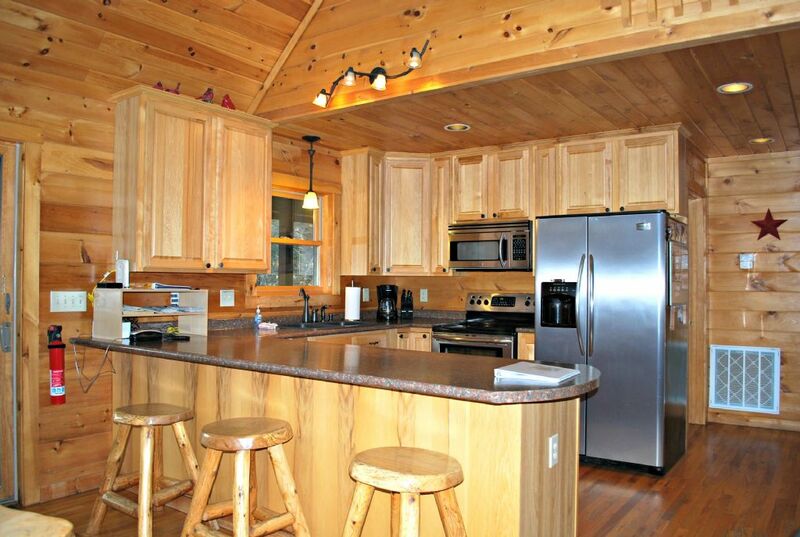 The cabin is outfitted with an upscale kitchen including stainless appliances, dishwasher, flat top range, microwave, blender, electric griddle, etc. Enjoy your meals at the dining table or the large eating bar. 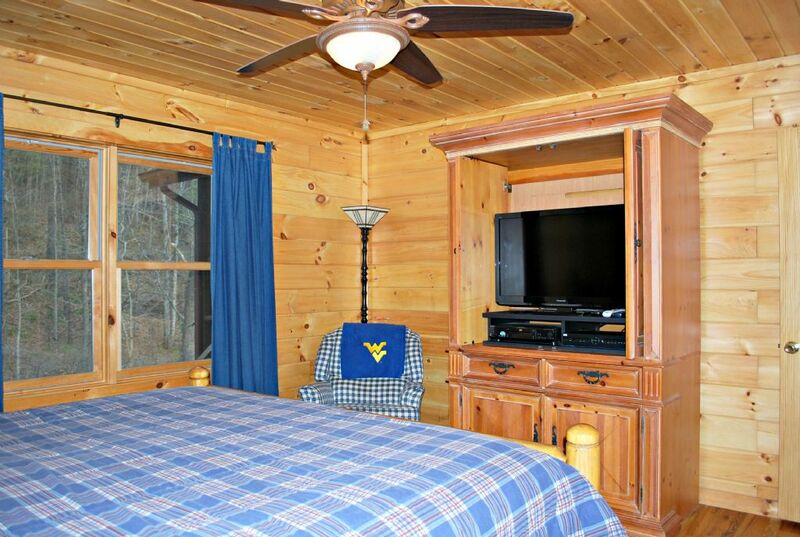 The main level is also where you will find the master suite w/king bed, flat-screen HDTV and DVD. 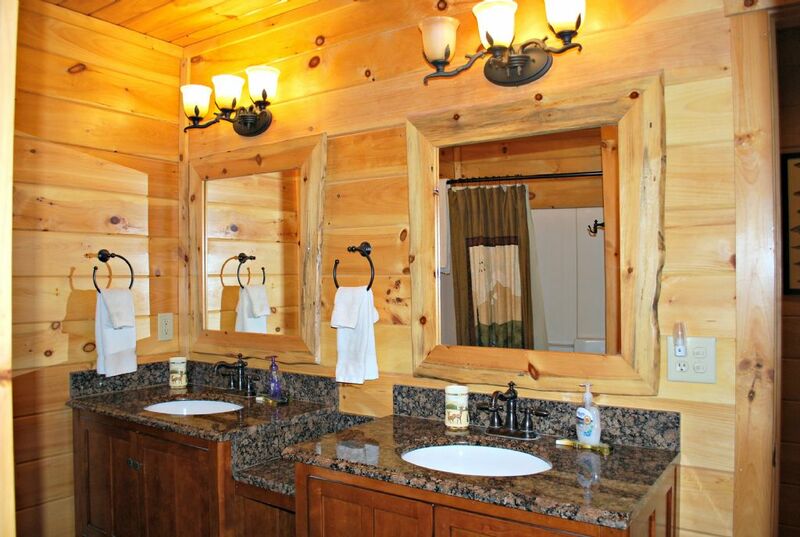 The full bathroom has a private water closet and dual vanities. The upper level offers 2nd bedroom with queen bed, Satellite TV and DVD, 3rd bunk room with full and twin beds and 2nd full bathroom. The lower level den/game-room is sure to please all ages with a gas log fireplace, a shuffle board table, air hockey table, electronic dart board, refrigerator w/mini-bar set-up, card/game table and comfortable seating to enjoy the game or good movie on the large screen flat-panel HDTV w/DVD and stereo system. 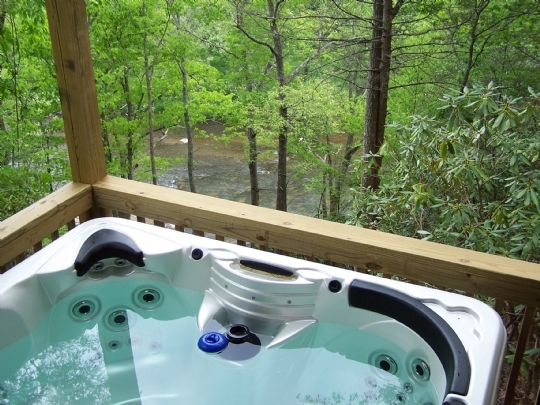 Step out onto the lower deck to read your favorite book or take a nap on the hammock or better yet, unwind in the private 6 person hot tub while enjoying the riverfront view. Also on the lower lever is the 4th spacious bedroom with king bed and crib, the 3rd full bathroom and the laundry area with full size washer and dryer for your convenience. Relax on the decks or venture out to the back yard to roast smores on an open fire. Take a short stroll to the river bank to have a picnic, enjoy the sounds of the river or catch a small mouth bass. Central heat & AC and ceiling fans in all bedrooms. Towels & linens are provided - just bring your food & paper products! Small family dog less than 25 lbs. allowed with prior notice & pet fee. Larger dog may be permitted with written Approval Only. For your convenience and your pet’s safety, a new 5x10 covered dog kennel has been added just off the lower deck as well as an indoor crate inside cabin on lower level. MAXIMUM OCCUPANCY is 9. 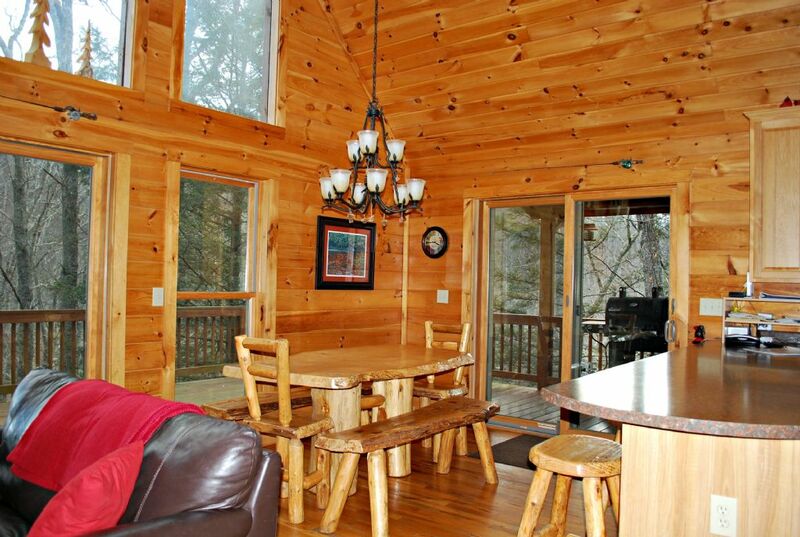 The cabin sits on a beautiful, mountainous lot. For the driver who has experience on gravel, the driveway is navigable with front wheel drive. Our weekly rate reflects 7th night FREE! Our monthly rate reflects 28 days! Easy Check-in at your selected cabin!